A few years ago, Chimamanda Ngozi Adichie received a letter from a dear friend from childhood, asking her how to raise her baby girl as a feminist. Dear Ijeawele is Adichie's letter of response. Dear Ijeawele is powerful because it’s short and sweet—the perfect disguise for a collection of ideas that attempt to set the world on fire. Some may wonder (yes, even after Trump) why setting the world as we know it on fire is a desirable action. Adichie’s work encourages you to look around and inward to see where gender binaries—pink vs. blue, doll vs. truck, mother vs. earner, giver vs. taker—have gotten us ... we cannot have a feminist movement in 2017 without Chimamanda Ngozi Adichie ... For Adichie, gender roles rob us of our individuality, and it’s a robbery that happens well before we even know it’s happening ... We do ourselves and our feminist future a disservice if we look at Dear Ijeawele as the beginning and end of a conversation. It’s an invitation, a call to arms. Adichie cannot light these fires alone. This particular love letter begs a response from those readers and writers who needed a jumping off point for their own manifestos. We feminists are not done with becoming feminists. And for those of us enjoying this ride, that’s certainly not a bad thing. Adichie's manifesto is no less consequential [than Between the World and Me], but in addressing her childhood friend she allows for jokey asides and allusions to their youth, adding welcome levity to the subject. Her responses, given in the form of 'suggestions' numbered 1–15, are extremely logical and stated clearly, full of Adichie's dry wit, and range from the obvious to the bold ... the suggestions are powerful and life-affirming, offering wisdom for everyone. And as much as this is a book written to mothers of daughters, fathers of daughters would benefit from reading it, too ... Her work is full of such soft-spoken gems — simple, wise counsel that compels readers to think critically about the world they plan to raise daughters in. A world where, unfortunately, that daughter's humanity will be constantly questioned; her autonomy hard-won; her peace of mind under relentless attack. Adichie's book offers practical advice you can take now to help her grow into a full person, a person who values equality for all human life — a person also known as (yes) a feminist. ...offers, as its title advertises, 15 ways that we — parents, mostly — can encourage girls to be strong, to plant the seeds of feminism. But more than that, Adichie hopes the book will help 'move us toward a world that is more gender equal.' ... Much of Dear Ijeawele will feel familiar to those who know Adichie’s previous works, but this book is more personal, more urgent ... The book delves into the personal as well as the political. Adichie points to Hillary Clinton as a prime example of the unfair way women are judged. 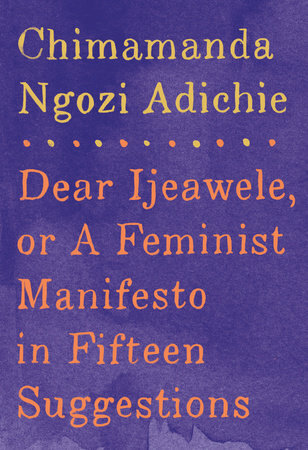 What did you think of Dear Ijeawele, or A Feminist Manifesto in Fifteen Suggestions?